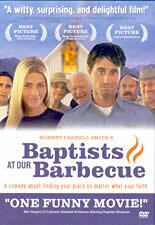 I recently watched Baptists at Our Barbecue, a mormon film by Christian Vuissa. I don't have a whole lot to say about the film. I can't say it was one of my favorite movies ever, for sure. It started out somewhat okay, but it quickly became a very cheesy, stereotypical movie. The movie tells the journey of a mormon police officer who has reached the age where he feels he should no longer be single. His eccentric mother is constantly trying to play matchmaker, and it drives him crazy. He decides to take the first transfer out of town to escape his annoying life and ends up in a poe-dunk town called Longfellow. This town is full of stereotypical small town folk. Gossip and zany behavior abound. Longfellow is evenly divided between two religions: the baptists and the mormons. Each tries to claim more members and status to outdo each other. There is some animosity between the two churches, and the often blame each other for mishaps in the town. The main character, Tartan Jones, feels quite out of place and considers himself the only sensible one in town and just hopes to find someone who sees things his way. The story unfolds when an attractive blonde lady, Charity, escapes to Longfellow in plain sight of Tartan. Call it "love at first" sight, for he is enthralled at first glance. And coincidentally, this is where the cheese-ball movie falls apart. Simply put, while Tartan is falling in love with Charity he miraculously helps the town break down its religious barriers between the two churches. The mormons get the idea of inviting the whole town, including the standoffish baptists, to a community barbecue. A few baptists show up, and the animosity breaks down from then on (through a series of weird, superstitious events). Tartan and Charity end up getting married, and everyone lives happily ever after. Basically, the movie is a mild ruse, an attempt to portray mainstream Christians as hateful and divided. The Baptist minister for example is shown preaching messages of disdain, outside for every passing Mormon to hear. As a Christian myself who attends a conservative baptist church, I don't really agree with the stereotype. Nonetheless, I'm sure there are baptist and other Christian pastors out there who preach hate and look down on others as less than themselves. Though I attend a baptist church, I don't call or consider myself "a baptist". In fact, I have attended churches of several denominations and found myself surrounded by brothers and sisters. Most denominations exist because of slight variations in doctrinal statements or practices. Of course no one has perfect theology, for we are fallen and base our judgments off our own "knowledge of good and evil", rather than adopting God's own perfect view and truth. My own personal view of the mormon faith is that is quite off track in many of its beliefs. A simple reading of Scripture (the Bible) would show anyone that. Their key document, the Book of Mormon , itself is full of logical and practical holes. Interestingly enough, the Book of Mormon has had many editions through the years, many such editions attempts to cover up some of the errors.